2009-10 Artifacts Hockey 1-200 includes LEGENDS & ROOKIES - YOU CHOOSE! 2009-10 Upper Deck Ultimate Signatures Auto Bobby Ryan Anaheim Ducks! 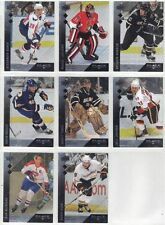 2009-10 09/10 Upper Deck UD Series 1 Base Cards #1 - 200 Stars, Goalies U Pick! Letter Marks of BOBBY RYAN. Card LM-BR. This card is Numbered 12/50. These cards are a SP. And very hard to find. The R is numbered 12/50. This card is in M/NM condition. Holder that I put them in. Letter Marks of BOBBY RYAN. Card LM-BR. This card is Numbered 40/50. These cards are a SP. And very hard to find. The N is numbered 40/50. This card is in M/NM condition. Holder that I put them in. Letter Marks of BOBBY RYAN. Card LM-BR. This card is Numbered 25/50. These cards are a SP. And very hard to find. The Y is numbered 25/50. This card is in M/NM condition. Holder that I put them in. Letter Marks of BOBBY RYAN. Card LM-BR. This card is Numbered 30/50. These cards are a SP. And very hard to find. The A is numbered 30/50. This card is in M/NM condition. Holder that I put them in. BOBBY RYAN. 2009-2010 UPPER DECK SP AUTHENTIC SP ESSENTIALS NUMBERED INSERT CARD. 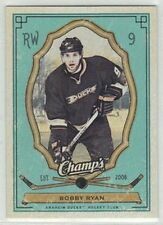 CARD IS NUMBER 104 AND IT IS NUMBERED 0355/1999. 20009-10 UPPER DECK TRILOGY ICE SCRIPTS CERTIFIED AUTHENTIC AUTOGRAPHED ROOKIE CARD PERSONALLY SIGNED BY GREAT YOUNG NHL ALL-STAR BOBBY RYAN. WE WILL NOT DISAPPOINT YOU. [ HYLI/HML ]. From 2009-10 Upper Deck Ultimate, an Ultimate Signatures autograph card of Bobby Ryan. Card #US-RY. BOBBY RYAN AUTOGRAPH. 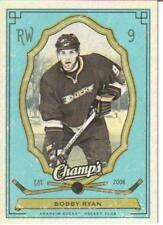 2009/10 UPPER DECK ULTIMATE COLLECTION. ULTIMATE SIGNATURES. The card will be placed in a penny sleeve, topload, team bag not taped and the invoice will be wrapped around the card. The card number is #104. To CANADA.